Petite Planet: Green Your Easter Basket with Washcloth Bunnies! Green Your Easter Basket with Washcloth Bunnies! Easter is quickly approaching, and here's another fun and easy way to make your Easter baskets more eco-friendly: make sweet little bunny rabbits out of washcloths! Choose new washcloths in a festive color, and bring them to life as cute inhabitants of Easter baskets, that may then be used as washcloths for bathtime. These washcloth bunnies are also a great alternative to plastic egg holders... stuff a few candy treats inside one of these critters instead! Read on for the super simple tutorial! 1) First fold your washcloth in half to form a triangle. 2) Then roll the washcloth from small point to long side. 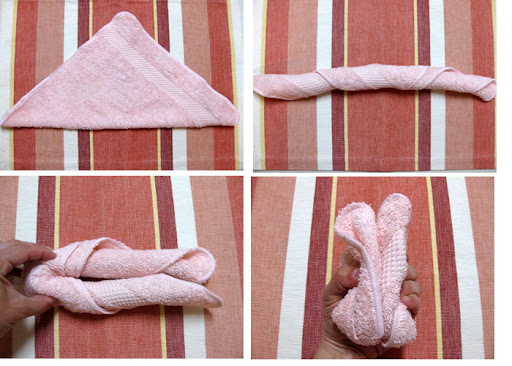 3) Fold your rolled washcloth in half. 4) Fold washcloth in half again and fold the loose ends back toward the fold. 5) Place a rubber band around the washcloth about 2 inches from the fold. 6) Cover rubber band with ribbon. 7) Tape on googly eyes, and pom pom nose and tail. *I recommend using tape so your washcloth is not ruined by glue -- because you'll want to use it after Easter for tub time! You can also place an egg in the back of the bunny and use it as a holder. These washcloth bunnies are so cute and they also make great baby shower gifts! Your kids will love these adorable bunnies to hop on into their Easter basket this year! we used to call them boo boo bunnies and you can put an ice cube in the little loop you form for their body. helps to cool any of those bumps and bruises. Hi Mandy- That is such a cute and clever idea! Thanks for sharing! Woo-Hoo! Congrats on being included in today's Craft Magazine Daily. I love this idea and your directions are simple, easy, and clear. Thanks for sharing! Thanks, Suzanne! We hope to see you back here at Petite Planet often! We call them Boo-Boo Bunnies, also. Great new idea for holding store gift cards for older Easter recipients, and raisin boxes or little envelopes of stickers, etc for children. It's a plan! Thanks for showing me how to do this. When i was growing up we had one we called a Booboo Bunny, and I've been wanting my own but didn't know how to make it. Thanks for stopping by, Doehler Days! So glad you'll be able to make these Booboo bunnies now! Thanks I have been wanting to make these for a while.... 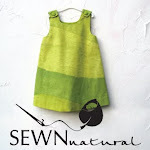 I featured you on my craft blog just so you know! Thanks for sharing it was great fun! I use to make these all the time and put a bar of good smelling soap in it to sit in the bathroom or they make cute gifts for Easter. I love these flannel bunnies - they'd make such a perfect Mother's Day gift with a little treat hidden in the back! Sure, Susie! Please link to this post!